With Haridwar facing landslides in several mountainous terrains, particularly in the Shivalik mountainous terrains, posing danger to nearby residential colonies, the administration has decided to survey such sensitive areas in parts of the Shivalik terrains and Mata Mansa Devi mountainous region. Almora MP Pradeep Tamta today requested the Uttarakhand government that it should immediately shift the landslide and erosion-affected villages of Dharchula and Munsiyari subdivisions of Pitthoragarh district. Tamta today visited the affected village of Qurie-Jimia, Sai Polo, Kualtham and Sainer and talked this correspondent from there over the phone. “A committee can be formed to facilitate shifting of these villages to the Terai region of the state after forming a land bank there,” said Tamta. With a record rainfall being witnessed this monsoon, the Gang Nahar has been closed these days to prevent accumulation of silt in it. While a heavy rainfall has been experienced for the past week in upper regions of Uttarakhand as well as in plain areas of Rishikesh-Haridwar, the scenario is no better in Uttar Pradesh and Delhi, forcing the authorities to stop release into the canal. The rains have failed to put a damper as far as the participation in the ongoing annual Nanda Devi fair is concerned. Chants of ‘Ganpati Bappa Morya’, late-night devotional programmes and Rasleela enactments have drenched Haridwar in the worship of Lord Ganesha as Ganesh Chaturthi celebrations continue in the holy city. Finally, consensus was reached over organising the annual Autumn Festival at a meeting held on the Palika premises here yesterday in which it was decided to organise the festival from October 15 onwards. Absence of political will and elite resistance is preventing extension of basic amenities and services to the poor living in the slums. The 17th anniversary of the Batagad police firing incident was observed as Balidan Diwas at the Shaheed Sthal near the Jhoola Ghar here today. Uttarakhand andolankaris gathered in large numbers and offered tributes to the deceased. The Congress has decided to hold a statewide agitation on September 18 against the failure of the state BJP government led by Chief Minister Ramesh Pokhriyal Nishank to effectively deal with natural disasters. In a meeting held by the Bhartiya Kisan Union (UKD), state union in charge Sanwali Devi and vice-president of the BJP and BKU patron Rishipal Ampavat addressed a gathering of BJP activists and senior members of the BKU at the Hindi Bhawan here today. An undertrial, who was brought to be produced at the District Courts for a hearing, escaped from police custody here this afternoon. In a freak incident, an eight-year-old boy was killed when he was run over by a shunting railway engine in the Lal Kuan area yesterday. According to information, the boy was running on the railway track after pressing his eardrums with his fingers when he was hit by the engine from behind killing him on the spot. Sant Baba Harvansh Singh and Baba Sukha Singh inaugurated the first floor and parking of Gurdwara Sri Guru Singh Sabha situated at Adhat Bazar here today. According to information, the Sukhi river once again proved to be the sorrow of the Shakti Farm area of Udham Singh Nagar as it washed away an embankment flooding three residential colonies. The surge in the Surya nullah in Chorgaliya led to the washing away of a sport utility vehicle and a motorcycle. The passengers of the vehicles were rescued in time. However, a woman in the Kapkot area was not lucky to survive when she was washed away in the Saryu river. Her body was recovered 4 km away from the spot where she had been swept away by the gurgling waters. Reports say 41 persons from the districts of Almora, Pitthoragarh and Bageshwar have perished in the rains this year so far. It is learnt that a large number of people living in Saryu, Pindar and Revati valleys have migrated to safer places on account of the continuing rains. Bageshwar district continues to be among the worst-affected areas in the region with even communication facilities getting damaged. The Saung-Munar road and the Shama road have been damaged as boulders continue to fall on them. The other routes shut down for vehicle movement are Chami-Kwairali, Dafot, Garud, Pindari, Kanda and Takula roads where debris has accumulated following massive landslides. Large tracts of agricultural land with standing crops have been devastated. Reports say about 10 villages in the Saryu valley continue to face a severe food grain crisis. There is a shortage of wheat, jaggery, salt, sugar, cooking gas and kerosene. The district administration had reportedly distributed things like rice, kerosene, cooking gas and other essentials on August 25 and after that there has been no supply to these areas. The district authorities have issued fresh orders for immediate supply of essentials to these areas. 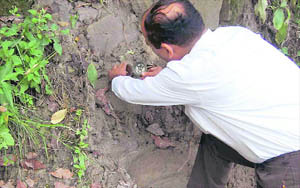 A team of scientists is mapping these terrains which have become landslide-prone in rainy season. Thousands of people live at the base of these twin mountainous terrains, the most-affected areas being Bhimgoda, Khadkhadi, Brahampuri and the hilly bypass starting from the upper road to the route to the famous temple of Mata Mansa Devi. Even some areas nearing Har-ki-Pauri falling on the lower part of these terrains are also susceptible to landslides. The team of scientists has taken samples of mud, stones and sand from these areas. Pointing out that a long-term plan is needed to effectively stop landslides in the region, the team suggested the construction of a strong wall to check frequent landslides. One of the scientists from the team, Dr Deepak Hatwal, said the terrains were quite sensitive and they would only file the final report after examining all samples that they had taken from the site. Notably, this team came to inspect the area on the directions of Garhwal Commissioner Anay Singh Nambiyal, who on getting several complaints regarding the landslides had assured residents of necessary steps in this regard. Meanwhile, residents also gave their inputs to the scientists. Many people said an effective long-term planning was needed, but subsequent governments had failed to do so. Whenever pressure mounted they sent a survey team to pacify people, but as the monsoon passed, the recommendations bit the dust in office files. The MP was also moved by the plight of villagers who are living in temporary shelters. “But as the cold season is nearing and snowfall is occurring on these mountains, it will be difficult for these people to live in tents at the 7,000 feet height. The district administration and the state government should think of it at first priority,” he said. Tamta said the Qurie-Jimia incident could have been more fatal than what happened at La-Jhekla of Munsiyari last year. “I don’t think that people of Qurie-Jimia will be able to cultivate their fields again. As far as the claims of the District Magistrate on construction of new houses after giving affected villagers Rs 35,000 subsidy are concerned, there is no land left in the village safe for house construction,” said Tamta. Heavy silt has been accumulating in the canal for the past few days which also needed to be cleared work on which has already started. 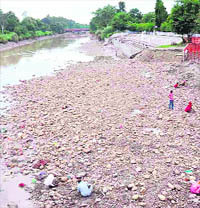 Talking about the current situation, Executive Engineer of Gang Canal (Northern Division) Naveen Kumar said the step had been taken in view of incessant rain that had been posing threat to the areas close to the Ganga, while in UP and Delhi the canal level was already touching the danger mark. Department officials said though water release into the canal had been stopped, it would have enough water to maintain potable water supply in the two states for the next five days. Water for irrigation purpose was not needed, particularly in Uttar Pradesh, as already there had been widespread rains. Meanwhile, with the closing of the canal, pilgrims and tourists are quite amazed as they are having problems in performing rituals besides spending time on canal ghats. On the other hand, for rag pickers and poor people living in adjacent slum colonies, this has come as a boon. Now, they can search coins and other items from the canal bed easily. Heaps of garbage, particularly plastic, can be seen stucked on the lower part of the ghats, but as this is an emergency shut down of the canal, the administration is not cleaning it up. The annual cleaning and upgrade of ghats and canal is done in October. People from areas in and around Nainital have started coming to the town in large numbers for the annual event that was inaugurated on Sunday but has started attracting maximum participation since this morning as the newly made idols of Goddesses Nanda and Sunanda were placed at their designated place in the Naina Devi temple after the traditional rituals in the early hours of the day. With the administration declaring a local holiday on the occasion, a large number of people visited the temple to pay obeisance to the local deities and then moved to the adjoining Flats Grounds to see the fair. Children had a good time enjoying rides on merry-go-rounds, giant wheels and other attractions. The number of visitors continued to increase with every hour. The town itself is wearing a colourful and festive look since last evening. Both Tallital and Mallital markets have been decorated with lights and confetti. Gates welcoming the visitors have also been put up at several places around the town, particularly on the roads leading to the temple. The first three days of the event saw the formal inauguration of the fair which was followed by the dispatching of a team to the village of Aam Padav for bringing the banana tree from which the idols were carved out. The carving out of the idols from the tree is a traditional art of the locals and is a treat to watch. Once carved, the goddesses are invoked and the idols are placed at their designated places on the temple premises for the next four days. On the fifth day, they will be immersed in the Naini Lake. Old timers say the logic behind making the idols from banana tree is that it does not pollute the water body on immersion and, secondly, banana is the most used article in Hindu rituals. The Nanda Devi fair is celebrated across the region and similar fairs are organised in the various townships and districts. This is the 107th mahotsava being organised in Nainital. It has been given the designation of a state-level event and is being telecast live for residents of Nainital, Haldwani and Lal Kuan. Though Ganesh Mahotsava used to be organised in the city earlier as well, yet, as per old timers and local residents, the festivities in the past few years have assumed a grander scale. This year, many Ganpati idols have been installed at temples and pandals across the city. 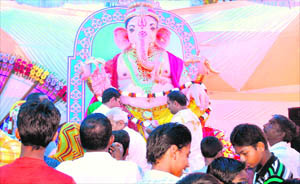 Huge statues of Lord Ganesha have been installed and daily puja and other rituals are being performed. Bhajan sandhyas and enactment of Rasleela is drawing huge crowds at these pandals. For many residents, it is as though Ganesh Chaturthi celebrations of Maharashtra, especially Mumbai, have been recreated in the holy city. At BHEL Sector 3, a large-scale Ganesh Mahotsava is being celebrated while in other city temples, people are busy worshipping Ekadanta and performing rituals. The Ganapati Yatra Sangh has arranged for the recitation of Ramcharitmanas after the installation of Lord Ganpati’s idol. The narration being done by Vyas Pandit Vindo Nayan will continue till September 20. The members from various organisations in Mussoorie were invited for their suggestions in conducting the festival smoothly this year. Palika President OP Uniyal announced that the festival would begin with a road show on October 15 and carried on for the next seven days. Spokesperson for the Hotel Association Sunny Sahni said their association would provide lodging and boarding to artistes from outside the town. The Press Club of Mussoorie, traders' association and various clubs also consented to participate in the festival with a novel programme this year. The convener for the festival will be ward member Sushil Agarwal, along with the Palika President. Eminent journalist Jai Prakash Uttarakhandi said the festival had its own history as it was started in 1950 to promote the business and culture of the area. He also said artistes like Manna De had graced the stage occasion during the festival. On Tuesday, a committee was formed for the festival, but the budget and the date for the tender procedure are yet to be finalised. Following the announcement of the dates for the annual Autumn Festival by the Nagar Palika, voices of dissent have also gained momentum. Parvitaya Bigul Sanstha president Pradeep Bhandari, in a letter written to the Chief Minister and other senior officials, has stated that the state is in the grip of gloom due to natural disasters that have occurred in various parts of the state leading to loss amount to Rs 1,200 crore and rendered many homeless. In such a condition, the festival as announced by the Palika should be organised without much grandeur. Expensive artistes should be avoided and local talent given an opportunity, which will not only reduce the expenses of the Palika, but also assist in promoting the local culture of the state among tourists for which the festival was conceptualised several decades back in Mussoorie. Bhandari also suggested that this year the shopkeepers should decorate accordingly and awards should be kept for the best decoration. He also said the dignitaries, who had contributed in the development of the town, should be felicitated during the festival. He firmly stated that out of seven days, as proposed for the festival by the Palika, five days should be marked for the artistes of the state. He recalled that for the past two years the expenditure on the festival had increased to whopping Rs 35 lakh to Rs 40 lakh and if his suggestions were accepted, the festival spending would come down to Rs 15 lakh, and certain amount could be donated to the Chief Minister’s Fund for disaster relief. Bhandari said the whole town contributed in cash and kind during the festival, but for the past two years the policy of neglecting the social and cultural organisation had become order of the day. The policy of giving the festival to event management firms from outside the town was filled with anomalies as was evident from previous year’s experience, where large-scale irregularities were reported in the tender process. Therefore, to avoid controversies, the festival should not be given on contract, but instead a committee of people experienced in organising such festivals should be solicited, including senior citizens. “Unless and until there is a concerted effort to extend services to the poor and solve their problems, certain parts of the cities will continue to remain devoid of development, posing challenge to the administration and people at large,” said Indu Kumar Pande, Chairman of the State Financial Commission. He was speaking today at a regional workshop on Resource Mobilisation and Sustainability in Urban Poverty Alleviation, organised by the Regional Centre for the Urban and Environmental Studies, Lucknow, in collaboration with the Department of Urban Development. Calling for greater coordination between the local urban administration, the Finance Department and urban local bodies, Pande urged the urban local bodies to reduce their dependability on the state by generating their own resources. “You need to devise ways to ensure that large floating population is taxed directly or indirectly and so that the finances thus generated can be used for extending services to the poor. Usually, these areas fall outside corporation and even local bodies, but take benefits of the cities by putting pressure on the overstretched services,” he said. On the other hand Mayor Vinod Chamoli said the needs of the urban poor in the hills were a little different as there were no slums and the survey underway in the state should be able to take into the unique nature of these habitations. He also called for initiating administrative reforms in the local bodies in the state. “We need skilled people at all levels and this can be only achieved by outsourcing certain works,” said Chamoli. Besides, he requested the State Finance Commission to make advance planning by holding meetings with representatives of local bodies to gauge their financial needs. While Dr Richa Varmani, Joint Director of the Regional Centre for Urban and Environmental Studies, Lucknow, said the local bodies should identify other revenue streams and put in concerted efforts to improve existing revenues. “This can be done by imposing user charges, levying sewer charge and even floating municipal bonds,” stressed Varmani. The members recalled the sacrifice made by the martyrs at Batagad when they were cornered by the police and fired at without provocation during the separate state movement. Uttarakhand Andolankari Manch convener Jai Prakash Uttarakhandi said Mussoorie had played a very important role during the movement for the separate state as more than 3,000 persons participated in it actively. He demanded that all involved should be identified as active andolankaris without any delay. Andolankari manch president Devi Godiyal also spoke. The members also met SDM Manoj Kumar and apprised him of more than 600 applications submitted to the administration on the identification of andolankaris in 2006-07, out of which 225 had received the identification certificate and rest had not yet been processed. Ujjwal Negi, Rajni Negi, Rajeshwari Negi, Tara Devi and others were present on the occasion. She said the farmers had been facing hardships because of the wrong policies of the state government. It had become difficult for them to continue to farm with the escalating prices of seeds and manure. She demanded electricity free of penalty for farmers, 50 per cent subsidy for electricity, diesel, manure, pesticide and agriculture equipment. She also asked for a simplified procedure for the consolidation of land and availability of 25 hand pumps in each village. “The villagers should also be given APL/BPL cards. Their wages under the National Labour Guarantee Act should be increased from Rs 100 to Rs 250. In cottage industries, employment should be given to 75 per cent local people. Similarly, pension for old people should be increased from Rs 400 to Rs 1,200,” said Sanwali. Yogesh Kumar, a native of Sahsapur, was caught by the police in July in an attempt to murder case. The accused who was remanded in judicial custody was locked up in the Dehradun Jail. The deceased has been identified as Sahil from the Bengali Colony. His father Mohammad Irshad is a tailor. The body was collected by the General Railways Police (GRP) that got his postmortem done and handed it over to his family. The burial of the deceased was to be done at his village in Baheri. Head Granthi Bhai Bhupal Singh said, “At the behest of his mother Mata Panjab Kaur, Sri Guru Gobind Singh reached Dehradun on September 15 in 1687 to punish those followers of Baba Ram Rai who had burnt Rai to death when he was absorbed in a trance”. On the occasion, Baba Sukha ji, Cabinet Minister Harbhajan Singh Cheema and Chief Editor of Jan Bharat Mail Gurdeep Singh Sahotra were also present. Among the religious leaders, president of Gurdwara Sri Guru Singh Sabha Rajender Singh Rajan, vice-president Jathedar Daleep Singh and General Secretary Manjeet Singh also attended the function.